First observed in Southern California in 1927, World Trade Week was founded by Stanley T. Olafson, then manager of the World Trade Department of the Los Angeles Area Chamber of Commerce. By 1935, President Franklin Delano Roosevelt had officially proclaimed World Trade Week a national observance by the U.S. Government. Initially created to promote the ports of Los Angeles and Long Beach, World Trade Week expanded its scope following World War II. Today, World Trade Week actively promotes the positive aspects of international trade that are vital to a strong local and national economy, under the guidance of founding sponsors the Los Angeles Area Chamber of Commerce, Los Angeles World Airports, the Port of Long Beach and the Port of Los Angeles. 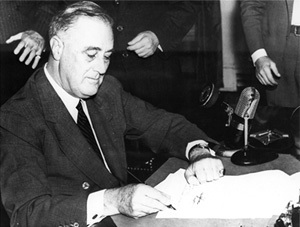 Above left, President Franklin D. Roosevelt proclaiming World Trade Week a national observance. 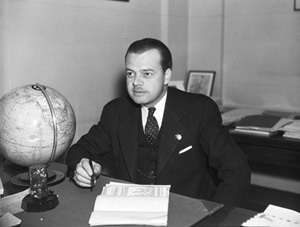 Above right, Stanley T. Olafson, founder of World Trade Week.